This is the second post in the Homeschooling "Big Kids" series. In last week's post I outlined some of the challenges and joys of homeschooling big kids. Judging by the response the post received, many of you can relate! While I write to encourage others, this post and the comments I received afterwards, encouraged ME. After feeling a bit lost during my daughter's sixth grade year, I knew we needed direction, motivation, accountability, and a like-minded peer group. 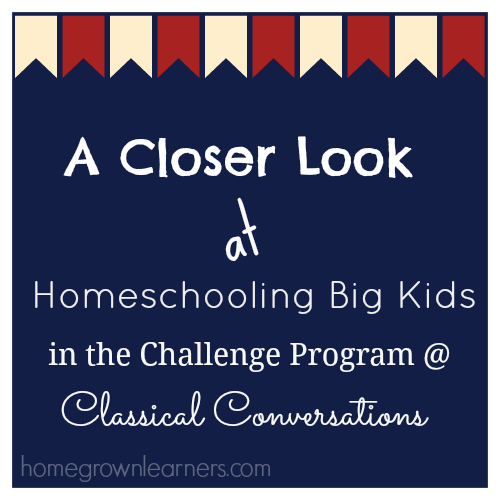 Enter Classical Conversations - and specifically, the Challenge program. Challenge is a program designed for 7th-12th grades. Typically, a Challenge group is a small group of students and one tutor, and meets for 30 weeks during the school year. "Based on the classical model of education, students at this age move into the dialectic and rhetoric phases of learning. Students utilize our academically challenging curriculum, which is appropriately named the Challenge Curriculum. This curriculum involves Saxon math, Apologia sciences, classic literature, writing, debate, and much more. Students develop and strengthen the life-long learning skills of grammar, exposition, debate, logic, rhetoric, and research. This curriculum is supplemented by weekly classroom time with a trained Challenge Director/Tutor." My daughter has been in the Challenge A (corresponding to 7th grade) program for 18 weeks. I can ONLY speak to this level of Challenge. Each week she looks forward to attending her Challenge A class - each Tuesday 8:30-3:30. Yes, there is an expense to this program, but it is an investment we are willing to make in our child's education. Quite frankly, for the cost of a year of Challenge your child will get HUGE value. In my opinion (especially after we toured a local private Christian school and investigated the curriculums of two others), the depth and quality of the Challenge program is FAR SUPERIOR... no supposed "social" benefit of going to school full time can outweigh this beautifully crafted Classical Christian homeschool education my children are receiving. This is not meant to alienate families who choose another path - this is just the path that works for US. My daughter is not given "grades", and I am still the ultimate teacher. I like this. We can do as little or as much as we want with the suggested material, but we have chosen to go full tilt to get the maximum benefit. It's worth it. Her tutor doesn't "instruct", but rather GUIDES and MODELS. Miss Nancy is there to model how to learn and guide discussions with the children. It is a beautiful thing to watch. In her time at home Anna completes approximately 6 hours of work each day. It is recommended that each subject receive an hour of attention each day. This year has been all about SELF MANAGEMENT and DISCUSSION. It is the time in Anna's education where we need to be INTENTIONAL about what she is learning. Anna is learning to schedule and manage her own school work. She and I have two weekly "meetings", in which we go over assignments, drill flash cards, discuss the book she is reading, practice presentations, and more. Of course I am helping her throughout the week (we're learning Latin together! ), but compared to previous years of homeschooling she is MUCH more independent. 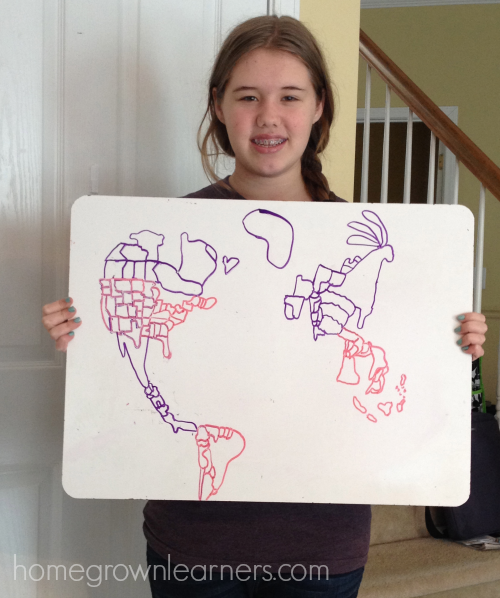 Let's use Geography as an example: Children in Challenge A will learn to draw the ENTIRE world from memory. They will also learn the names of each country, capitals, prominent features, and a glossary of geography terms. Each week we focus on a different part of the world. Daily Anna draws that section freehand and labels countries and practices capitals. She also makes flash cards of geography terms and quizzes those. I am ASTOUNDED by what she can now do - and it seemed impossible before. Yes, this is HARD WORK. Yes, it is sometimes TEDIOUS. But, I am learning that with this hard work comes great pride and accomplishment. She is learning discipline, attention to detail, and pride. The byproduct is an increased yearning for knowledge about our world in general. I could write you a book, but I will be brief. Challenge teaches our WHOLE FAMILY to THINK, QUESTION, and view all of our education as inspired by and pointing back to GOD. I can rest knowing that she is getting what she "needs"
I have been delighted to get to know Brandy, at Half-a-Hundred Acre Wood. I had long admired Brandy's blog and all of her creative CC ideas. She has been an inspiration to me, and recently has provided Godly counsel to me in some important matters regarding my blog. Brandy recently interviewed me about being a first year Challenge mom. In this interview we try to show you more about the Challenge program, and emphasize that you CAN jump into Challenge with no prior CC experience. If you do have CC experience that is GREAT! Please know that all of that memory work is put to wonderful use in Challenge - I PROMISE! It is such an extraordinary thing to watch all this knowledge collide in Challenge. Having a child in Foundations and one in Challenge is very enlightening - I can see how all of the pieces of the CC puzzle come together! Click here to read Brandy's interview of me - a first year Challenge mom. Through being in Classical Conversations, my husband and I are learning that this way of thinking and learning is a way of life and not merely an educational choice. It is SCARY to me that students today are spoon fed information from dry textbooks, expected to regurgitate that information correctly, and then graded on that same trivial material. What they really need is to learn to THINK CRITICALLY, QUESTION CONSTANTLY, and ARGUE LOGICALLY. Do not give up on your "big kids" just because they are testing you. Do not give up on them because you think they need more "extracurricular activities" or "socialization". Do not give up on your "big kids" because you think you did the "important" work when they were little. The best is yet to come! Do not give up on your "big kids" because you are worn out and need some time to yourself... soldier on and finish the homeschool race with grace, pride, and a sense of accomplishment. Your children need YOU at this age, and they need to see you actively seeking knowledge, actively questioning, and yes -- actively arguing. Homeschooling kids this age is HARD - but you owe it to your children to investigate all of your options and seek the education that best fits them. Take time to pray, talk with other moms, and pray some more. I am so glad I didn't make a knee-jerk decision to put my child back into school. That would have been a grave mistake. I am abundantly thankful to have found Classical Conversations, and to be in community with an amazing groups of families in our area. THIS is how I want to homeschool my "Big Kid"! What about you? How do you homeschool your "Big Kid"? Do you have questions about the Challenge program? Let's continue the conversation here about educating our children.